Gatefold cardboard cover with a sticker from front to back and an insert note included with instructions on how to receive an unreleased track from the same session. Mastered and Engineered in Echospace. Credits on the CD: Written + produced by Steven Hitchell in Soha, MI, USA, winter 2014. Reshaped by Intrusion 2016 in E.S. 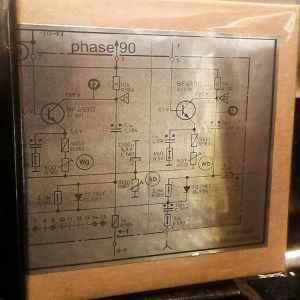 Mr Hitchell produces the goods yet again with a stunning reconstruction of his first Phase90 album "Infinitati". While the stripped down bare bones of the first album can still be heard, this is a completely new album to my ears! The mood is dark and menacing and the music melts around me like candle wax. Echoing dub chords resonate and undulate and the further into the album we go the more liquid the sounds become. Targum (Intrusions Sedation) is an astonishing piece of music with dense layers of sound and ghostly drones...there is so much going on in this track its unbelievable!! A wonderful tripped out excursion into experimental dub/techno & deep, dark electronic music.....Total bliss!!!! !